Gorgeous bathtubs, finished in an Aged Chrome effect exterior. The aged chrome is finished and protected by a high gloss lacquel finish. 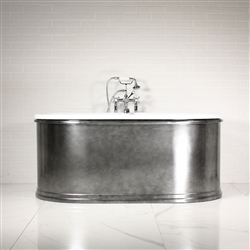 While we do not show every tub in our collection in an aged chrome exterior, upon request, every tub we offer can be finished in aged chrome.The aged chrome finish will not alter during the tubs' lifetime.